It was always going to be a bold move trying to create a movie inspired by a board game. They don’t particularly lend themselves to a clear narrative but if any would work, it would be the “murder mystery” Clue (or Cluedo in the UK). There are elements where it is successful but for the most part you’ll find it slightly underwhelming. For starters, it is a comedy. It was going to be the only the way the movie would work and was a good decision. It also has a scatter-gun approach for the jokes. Like similar movies Airplane or the Loaded Weapon series, it is almost a joke a minute and where some absolutely bomb or worse produce a large groan, some others are inspired and by the time one has fell flat, there is always another to raise a smile. It needs this approach because just like the board game it draws it’s inspiration from, there is little in the way of actual plot here. It is a film about seven people, all of which witness a murder, all of which could be the killer, trying to figure out who it is. You can’t blame it for sticking closely to the original game. It does mean that the comedy is the only element of structure, as murders continue, madcap events occur and like all screwball comedy movies, it begins to descend into chaos. Luckily, it has an able cast to handle the various comedy moments. The cast is actually more impressive than the movie warrants. 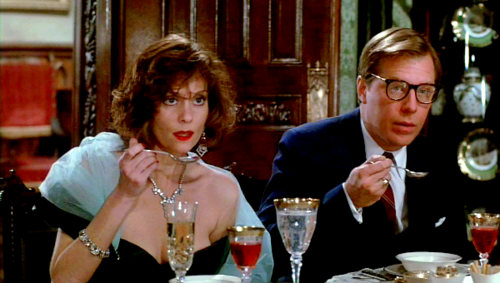 Christopher Lloyd is Professor Plum, Michael McKean is Mr Green and best of all is Tim Curry as butler Wadsworth. In fact, as the finale begins to come into sight, his recap of all the key events is a wonder to behold and one of the reasons he is such an underrated actor. Although this is a murder mystery, there is no possible way to figure out who the killer(s) are. It isn’t designed to work that way but the writers give it a good go with not one but three different endings for the movie. Nothing will be spoiled here but one particular ending (the third) works better than any of the others and links together events in a very clever way. 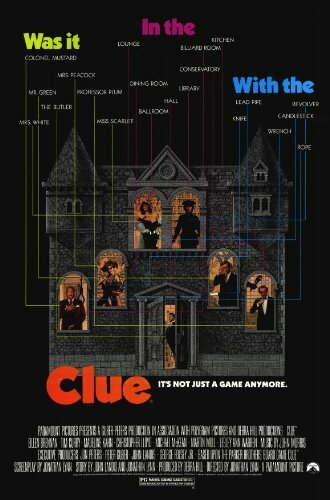 Overall, Clue is a bold movie, trying to bring a board game to the big screen and in keeping it faithful to it’s inspiration, it does a good job. Unfortunately, it also means there is little in the way of plot, some huge varying in the quality of humour and a cast who are better than this movie deserves.